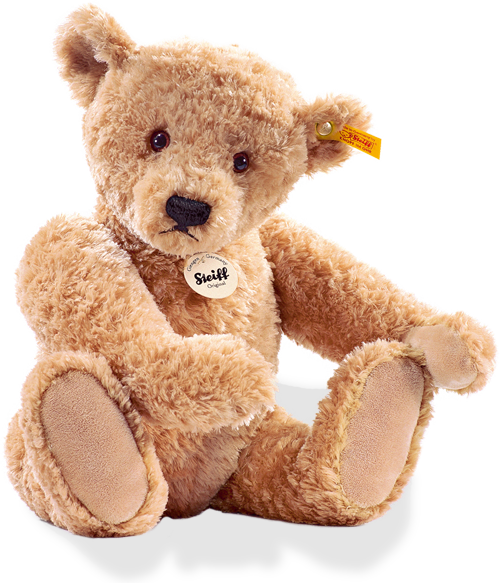 Steiff Cosy teddy Elmar - Loved By All Our Collectors Of Bears!, 022463 ~ Free Steiff Gift Box! Steiff Elmar - Loved By All Our Collectors Of Bears! "Fully jointed and superb Steiff bear"
Steiff Elmar Teddy Bear is made from soft cuddly plush in a golden brown colour. This Steiff bear is fully jointed (means arms, legs and head are moveable) and has such a sweet big face with glossy black/brown eyes and gorgeous hand embroidered black mouth and nose. Even his paws are made from a matching soft material. Just look at his body - as this bear is made with the famous Steiff shaped tummy, long arms and famous loveable Steiff face. Elmar is sure to be a favourite with any child - and is very desirable as he is styled on a Steiff classic bear.